THE next time you're worrying about what flower, rose or maybe potted plant to buy for that special someone, give a thought to those in the floral industry charged with going along and buying at the daily Aalsmeer Flower Auction in the Netherlands. Because here is the biggest flower auction in the world, and held in a building with one of the largest floor areas on earth – an amazing twenty-million flowers and decorative plants being sold here to commercial buyers every day, in a building whose floor area of 518,000 square metres is 52 hectares, or around the equivalent of 100-plus football fields. The first Aalsmeer flower auction was held way back in 1911 in a simple local eatery – the Café Welcome – and after that, auctions moved around various sites as they grew in size over the next 60-odd years, until the current gigantic purpose-built market was opened in 1972 near Amsterdam's Schiphol Airport as the-then world's biggest building by floor area. Flowers now sold here come from across Europe, and such diversely far-flung countries as Australia, Ecuador, Colombia, Ethiopia and Kenya, with roses (live and cut) the biggest sellers at twenty-eight per cent of all sales, three times as many, in fact, as tulips sold. 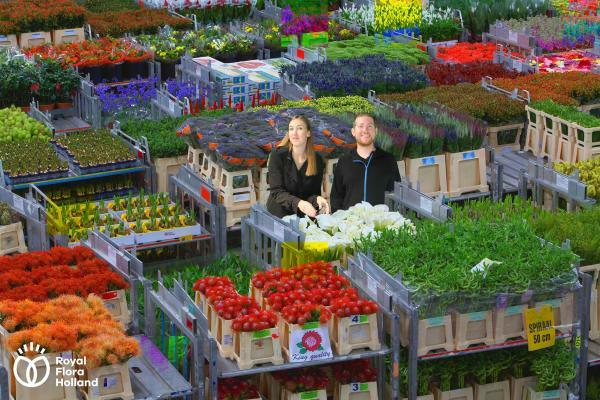 Some E4.6-billion (AU$7.3-billion) worth of flowers sell here annually using the Dutch Auction system, in which the price starts high and works its way down, with daily trading starting at 7am and being all over by 11am (Thursdays 9am.) Something like 280 battery-powered "scooters" hauling shuttles of trolleys, plus a form of miniature railway, are used to move each day's 20-million flowers around the vast building. An elevated Visitors' Walking Gallery for viewing the flowers on display and the auctions in progress has information panels in four languages... and be prepared for a long walk to take-in as much as you can, for remember this building has a floor area of 52 hectares. 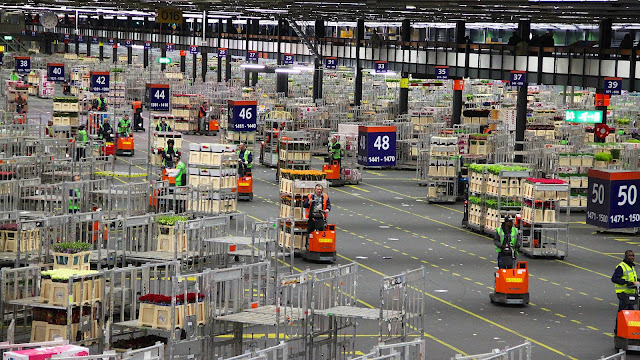 BUSY on the ground, some 280 battery-powered trolleys and a complete miniature-railway-like system shuttle 20-million flowers and decorative plants around the vast 52ha Aalsmeer Flower Auction building near Amsterdam's Schiphol Airport daily.